Will the real Berkely Mather….. 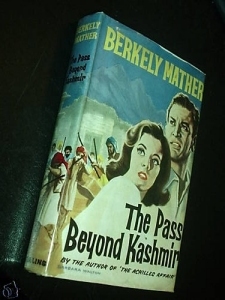 There are two versions of Berkely Mather’s biography, the official one printed on the back cover of his books, in obituaries after his death and told to his family and friends - and the real ‘alternative’ one which has largely been uncovered after his death by me, his son. They differ primarily in the details of his early life here, for the first time, are both versions side-by-side. 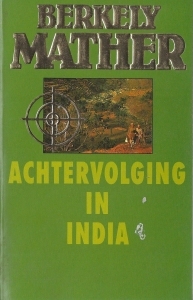 ‘Berkely Mather’ was the pen name of John Evan Weston Davies, born in Australia, the son of a doctor or, in some versions, a well-known Australian family. 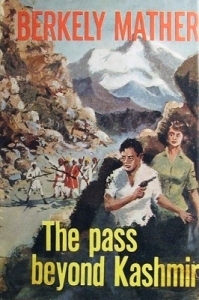 According to the biographical notes on the dust jacket of the American edition of The Pass Beyond Kashmir: “He rebelled against the respectable career (in medicine) that had been planned for him and set out to see the world sailing on tramp steamers.” Other ‘official’ versions have him working his passage to England where he was commissioned into the Army in 1932, subsequently applying for a transfer to the Indian Army and being posted to India where he served on the North West Frontier. During World War II he saw service in Iraq and Burma, finishing the war as an Acting Brigadier. John Evan Weston Davies was born in Gloucester in 1909. His father John Weston Davies had been apprenticed as a cabinet maker at Maples, probably the biggest and best furniture makers in the world at the time. He became a master cabinet maker for Maples and later for the Cunard line, some of his work being distinct enough to merit recording by the Victoria and Albert Museum. However, John took to drink and his career began a downward spiral resulting in his emigration to Australia as a lowly carpenter in 1913. After three years in Australia the Davies family disintegrated following the deaths of the two older sons on the Western Front and John Senior’s return to England alone, abandoning his wife and young John Evan. After education at the King’s School, Paramatta and military service in Australia John Evan, then aged 20, also left for England and drifted for a couple years before, in desperation, joining the Army in the ranks in 1932. He was posted to India as a private soldier to serve with a battery of Royal Field Artillery stationed in Lahore. Whilst on a few days disembarkation leave on arrival he conceived the idea of masquerading as an officer and when he turned up at the barracks in Lahore he spun a story of having been robbed of all his kit and papers in Bombay. The Battery Commander was puzzled since they were expecting a Gunner Davies not a Second Lieutenant Davies but as he seemed to have all the attributes of a Officer and a Gentleman he was accepted as such, taken to the Officers’ Mess and put on the payroll. He had bargained, correctly, that, in the days of tortuous communications between North West India and London, it would take some time before he was rumbled. This proved to be the case and he remained with the battery for nearly two years before the authorities began to catch up with him. Either through doing a deal (it would have been a source of great embarrassment for the Army if the story had come out) or through jumping before he was pushed, he swiftly transferred to the Indian Army Farms Department, the only branch of the Indian Army in which it was possible for a British man to serve in the ranks. He was made Sergeant and spent several happy but idle years travelling around India by car, buying forage for the large number of horses that were still the mainstay of transportation in the Indian Army. On the outbreak of war he volunteered for active service and was eventually commissioned in 1943 after which he served on the staff of General Slim, commander of 14th Army, and was Mentioned in Dispatches. 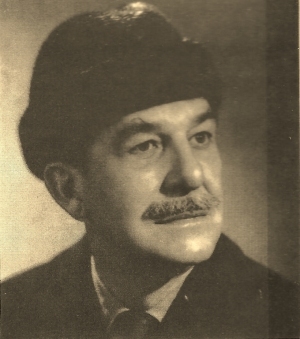 Weston-Davies returned to the British Army after Indian Independence in 1947 and served in Hong Kong, Egypt and Cyprus before eventually resigning his commission as a Lieutenant Colonel in order to write full-time. 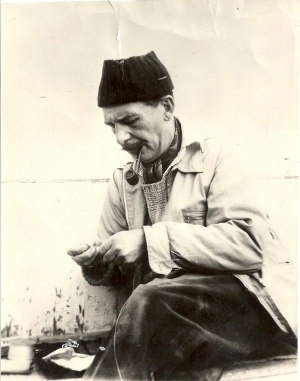 Berkely Mather fishing in Cyprus shortly before leaving the military. In 1954, towards the end of his military career, he was seconded to MI6 with a view to being inserted into Cairo in the cover of a dealer in oriental carpets with the objective of providing British assistance for the assassination or overthrow of Muhammad Naguib, then Prime Minister and President of Egypt and threatening to take over the Suez Canal. In the event, before he could be dispatched, Naguib’s co-revolutionary Abdel Nasser placed Naguib under house arrest and MI6’s plan was aborted. 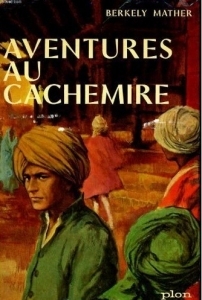 Berkely Mather’s writing career – and indeed ‘Berkely Mather’ – was born around 1940 when Sergeant Weston-Davies successfully submitted a short story to a British Indian magazine. As a serving soldier, it could not be published under his own name and he needed a nom de plume. Inspiration came when he and his wife Kay were sitting in a café in Poona (now Pune in Maharashtra in central India) discussing the matter. Looking across the street, they saw the Berkeley Grill and, next door, Mather’s the Chemist, both establishments having recently installed neon-lighting signs. The budding writer reputedly said “That’s it – my name’s already up in lights!” put the two names together, managing to mis-spell one, and the result was ‘Berkely Mather’. His first piece of fiction after the war was a radio play, sent in to the BBC after reading producer (and crime writer) Val Gielgud’s book on how to write for radio. Mather’s script was reputedly accompanied by the threat that if the BBC did not accept it, it would therefore be Val Gielgud’s fault! The play was accepted and Mather rapidly followed it with a play for that ‘new’ medium of television, even though at that time, he had never seen a television. Yet it was with the blossoming field of television drama in the 1950s, mostly for the BBC, that the Mather name became inextricably linked, as he proved himself a prolific and extremely fast scriptwriter, able to complete a 30-minute television script in 8 to 12 hours. In 1955 he penned the crime series As I Was Saying and the following year wrote two series, New Ramps for Old and Tales from Soho (starring a young Billie Whitelaw), and two one-off plays The Old man of the Air for American TV and A Fast Buck for the BBC which starred Lois Maxwell, later to find fame as the first ‘Miss Moneypenny’. In 1957 Mather created the character of Detective Chief Inspector Charlesworth, who was to feature in several series of crime dramas over the next four years and become one of the first popular ‘television detectives’. By the early 1960s, Mather and Ted (later Lord) Willis, the creator of Dixon of Dock Green, shared the accolade of the most prolific writers for British television and his contribution to television drama was recognised with a Special Merit Award from the Crime Writers Association in 1962. 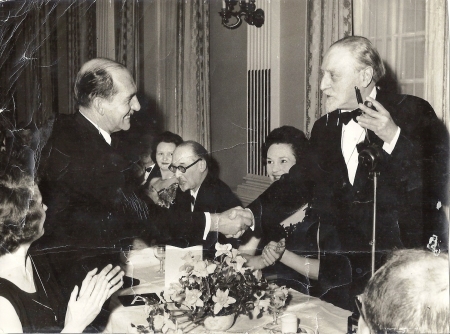 Mather receiving his Crime Writers’ Award from Sir Compton Mackenzie in 1962. Also pictured is the critic and novelist Julian Symons. 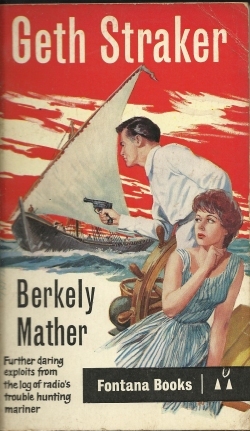 By this time Mather had also earned himself a reputation as a writer of radio serials and the adventures of ‘Geth Straker’, his piratical, Canadian trouble-hunting master mariner, had been turned into a volume of short stories to coincide with the success he was beginning to enjoy as a novelist. 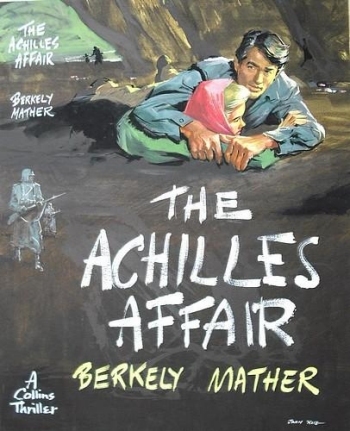 His first full-length thriller, The Achilles Affair, was published in 1959 when he was 50 and was both a commercial and critical success - Ian Fleming writing in The Sunday Times described it as “one thriller which I can unreservedly recommend”. 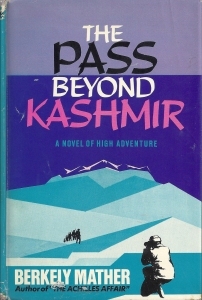 But it was his second, The Pass Beyond Kashmir, in which he drew on his life and experiences in India, which established him internationally in the front ranks of thriller-writers. That book also received high praise from Ian Fleming and it was probably not a coincidence that Mather received the call to work on the script of the film version of Fleming’s James Bond adventure Dr No. Mather, in hindsight, was clearly a better writer than he was businessman, for he was offered a (modest) flat fee or a percentage of the profits of the movie – and took the flat fee! Although film was his least favourite medium, and he was said to dislike adapting the work of others, he went on to work on scripts for From Russia With Love, Goldfinger, She, The Long Ships and Genghis Khan. In addition, he contributed scripts to TV shows such as African Patrol, Z Cars, The Avengers and the American series I Spy. 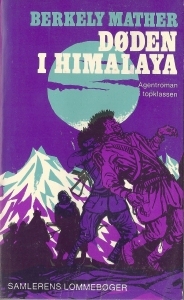 In 1966-67 he served as Chairman of the Crime Writers Association and from then on concentrated on writing novels, 16 in total, ranging from thrillers to historical adventures. 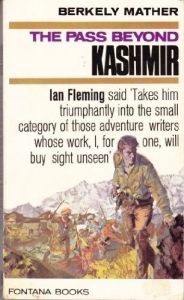 The film rights to three of his books were sold – The Achilles Affair, The Pass Beyond Kashmir and The Gold of Malabar – but none were filmed in his lifetime. John Evan Weston Davies (a.k.a. Berkely ‘Jasper’ Mather) died in 1996, aged 85. Why did my father give a false account of his early life? The short answer is that he was a story teller but in fact I think his boyhood was a troubled and unhappy one and he did not want people, including his own family, to know that. When he began masquerading as an officer in India in 1933 he needed a cover story. It was inconceivable in those days that an officer could be the son of a cabinet maker let alone a failed alcoholic carpenter; a distinguished Australian doctor was much more convincing. Once he had started the deception it was impossible to stop and even his wife was unaware of the truth. 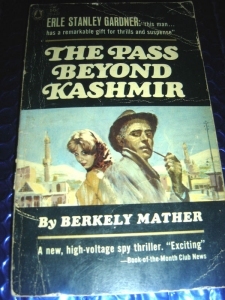 There may even have been another and more sinister explanation of Berkely Mather’s reluctance to reveal his early life – a deep dark secret on his father’s side of the family concerning one of his aunts. Three years ago, whilst researching his family history, Mather’s son and literary executor stumbled across a shocking story of true crime which had been suppressed by the family for more than one hundred years. Wynne Weston Davies has now written a book on his discovery and it could turn out to be a more incredible than anything conceived by that master story-teller, Berkely Mather. -Mike Ripley, Series Editor Top Notch Thrillers. 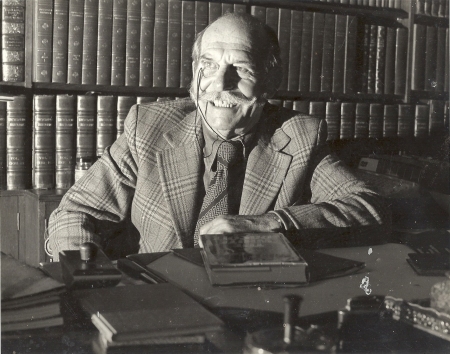 Berkely Mather in the study of his Sussex home in 1979.